Mesut Ozil has reportedly considered looking for a transfer away from Arsenal this summer after his struggles under new manager Unai Emery. The German playmaker was benched for the recent away win at Bournemouth and wasn’t in the squad at all for the North London Derby victory over Tottenham this weekend. Ozil’s work rate has been questioned in the past, though his place always looked far more assured under previous manager Arsene Wenger. 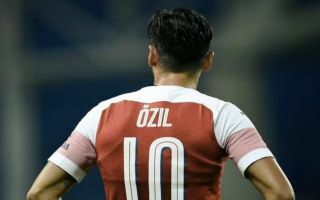 Emery is a more ruthless character, however, and this has seemingly led to Ozil considering his future just months after signing a new contract at the Emirates Stadium. This is according to the Sun, who state Inter Milan are ready to offer the 30-year-old an escape route from the Emirates Stadium at the end of the season. The Italian giants are one of the few teams who could afford anything close to Ozil’s big wages, and they could also do with capturing a big name like him to re-establish themselves as a force in the game. It remains to be seen how Arsenal fans will react if Emery ends up freezing out Ozil and sanctioning his departure, with the talented playmaker still generally a popular figure at the club despite his inconsistent nature.